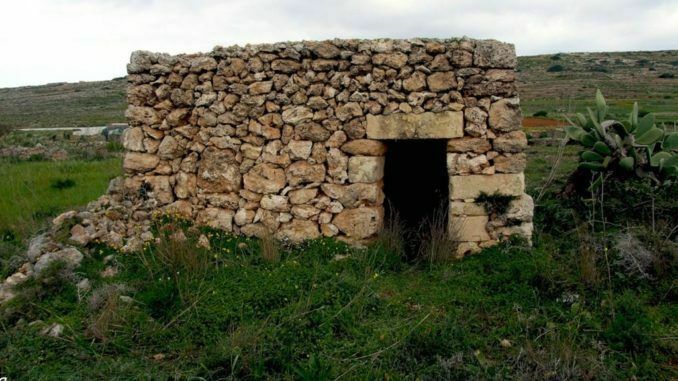 The history of the Maltese corbelled hut, known as il-girna (pl. giren), dispersed in the karstic plains of the Maltese islands has been quite elusive. Little is known about these drystone buildings. Queries related to the origins and role of the present giren in the development of the historical rural Maltese landscape remain partially unanswered. This article will present a synthesis of an archaeological approach to the study of architectural structures such as the girna. Such an exercise had as its principal objective the understanding of the reasons for construction the Maltese hut and its dating. The methodology of studyproposed is based on the principles of archaeological stratification combined with Landscape Archaeology and Historical Archaeology, starting with the premise that any structure needs to be understood as a cultural unit within its landscape. Thus farmhouses, corbelled huts, rubble walls, apiaries and so forth, as well as artificial spaces including fields, surface-quarries, roads and pathways, are perceived as cultural units within the landscpae. At this point, landscape is not seen as a mere backdrop but recognised as a palimpsest, preserving traces of past use, similar to stratified layers in an archaeological excavation. Hence the girna is understood as a unit within a stratigraphic sequence that can be represented through a matrix. Additionally, historical documents are utilized to obtain a chronological base for the structures built in the rural landscape. Consequently, the stratigraphic sequence is pegged to the dates obtained from the historical documents, making it possible to date particular units within it such as the girna. This method shows that it is possible to study the archaeological stratification of cultural units in rocky terrain where archaeological excavation is not possible because the terrain lacks discernible archaeological deposit. Deciding what to exhibit in museums: does it really matter?